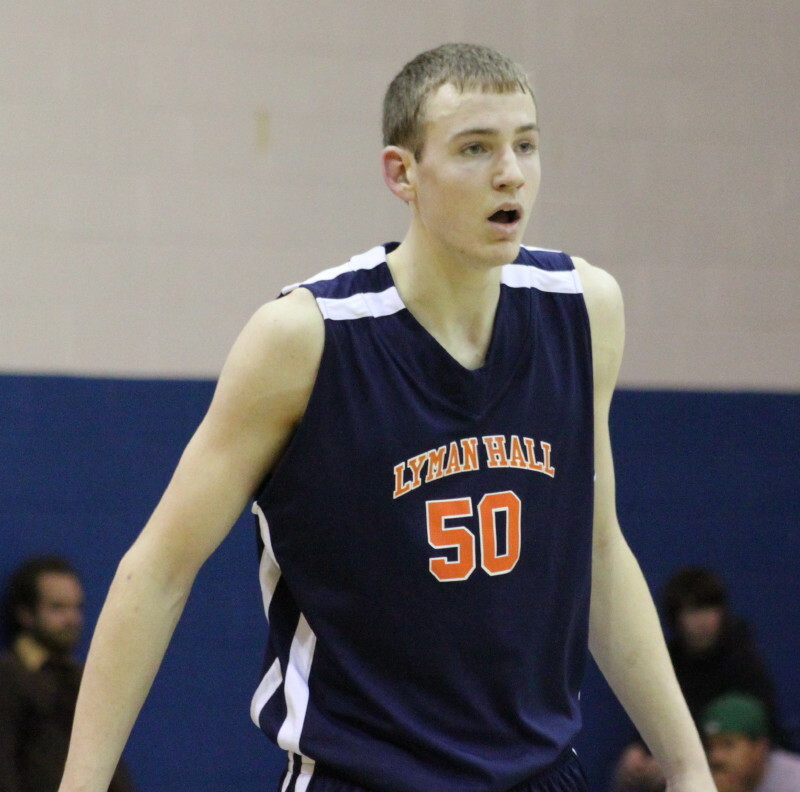 Kevin Ruys (14 points) had three first-half 3’s for Lyman Hall. (New Britain CT) It’s so easy to get taken in by it. Why go to the basket? Why go to the foul line? Why be patient on offense when you can score quick points from long range? Lyman Hall (19-6) from Wallingford fell into that trap on Wednesday night in the Class L semifinals at Central Connecticut State and it cost them. 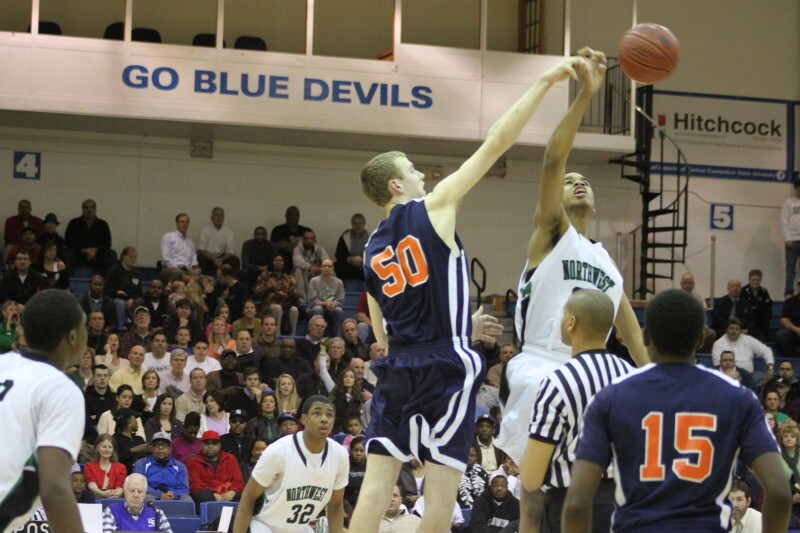 They were eliminated by Northwest Catholic from West Hartford (25-1), 54-48. The Trojans made six-of-twelve 3-pointers in the first half and thoughts of a major upset were in the air as they led, 26-20. The second half? The Indians got a lot more interested in the Trojans outside shooters and the open looks became barely open. That’s where the “fool’s gold” part kicked in. LH fired away anyhow and the second half saw them hit on just one-of-thirteen. Along with the long-range misses came some turnover-producing (12 in the second half) full-court defense. That deadly duo erased the Trojans’ halftime lead. 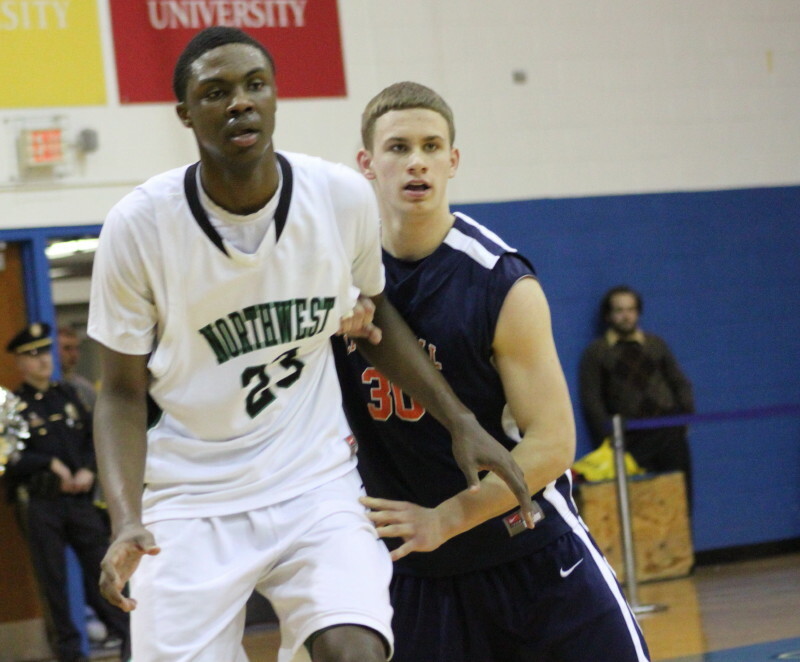 Joe DeSandre tries to contain 6-8 Kuran Iverson (17 points). A free throw by JC Carr (13 points) at 6:44 in the final quarter gave the Indians it’s first lead (36-35) since an opening free throw. A Jason Dempsey (11 points) free throw tied things at 38-38 with 5:51 to go in somebody’s season. The taller Indians got separation over the next three minutes. The run was 8-1. 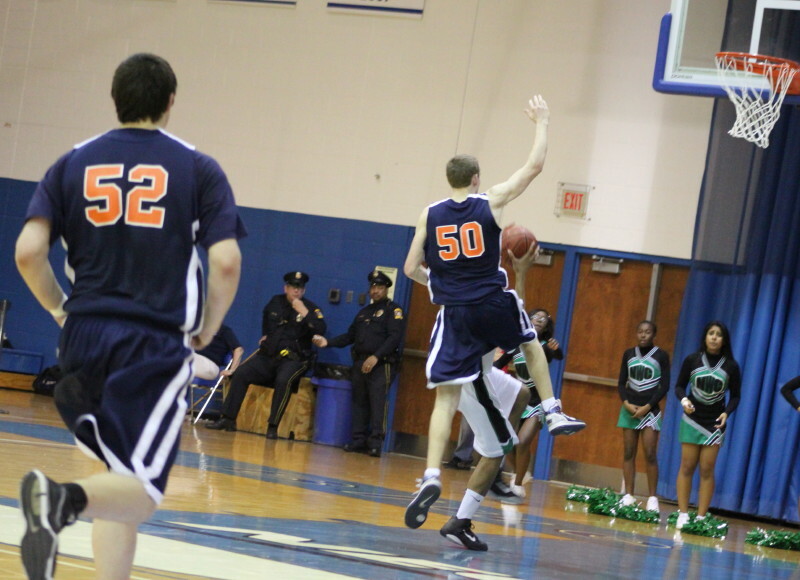 Nick Gaynor (10 points) finished an end-to-end layup and Kuran Iverson got in close for a dunk. Nick and JC added two free throws each. 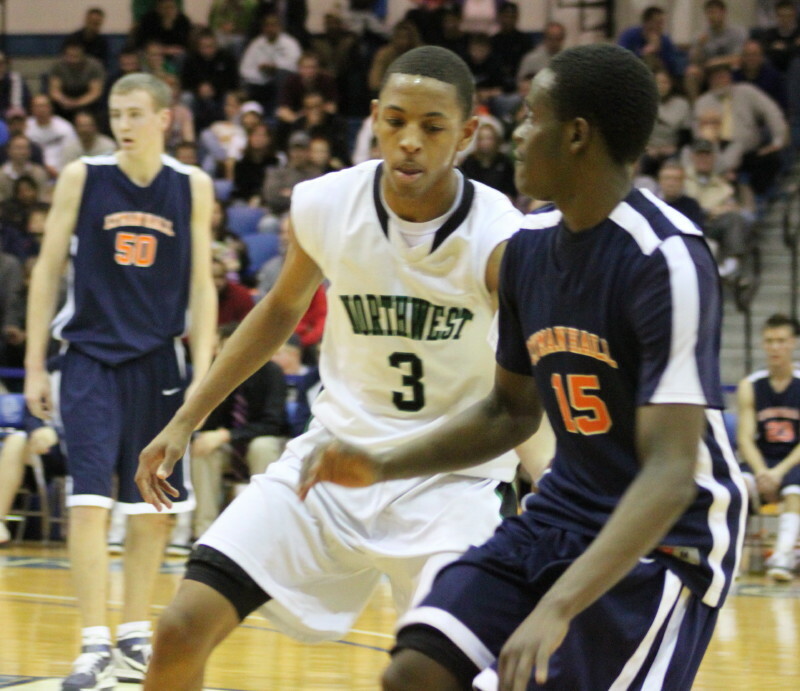 This activity gave Northwest Catholic a 46-39 edge with less than three minutes left. LH did not go away. Two Jason Dempsey free throws were answered by one Indian free throw (JC Carr) before LH finally hit a long one (Kevin Ruys). This put the Trojans just one possession away (47-44) with 2:23 remaining. 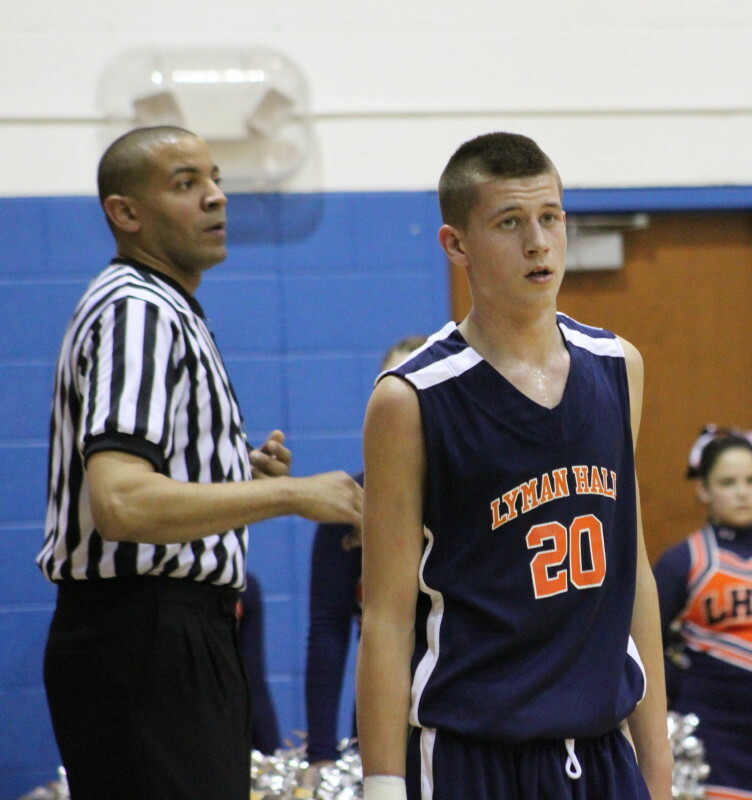 An offensive foul called on Tyler Huffman gave Lyman Hall the opening they needed……….but were unable to capitalize on. Richard Bronson (#15) gets some tighter second half defense from Zack Lewis (#3). LH got off four shots (by my count) before sophomore Kuran Iverson (6’8” – Division 1 prospect) took off full-court with a rebound and got fouled. This started six unanswered points for NC (single free throws by Kuran and Tyler Huffman, two free throws by Nick Gaynor, and a fast-break dunk by Tony Seldon). LH chose a bad time to get four empty possessions and were down and out, 53-44, with thirty seconds to go. 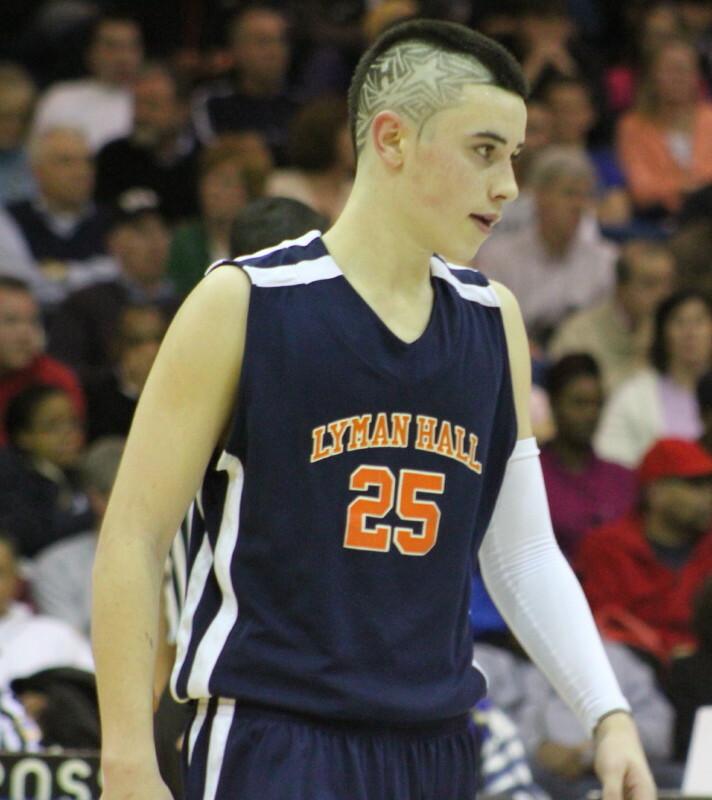 Kevin Ruys (14), Jason Dempsey (11), and PJ Higgins (10) were the leading LH scorers. 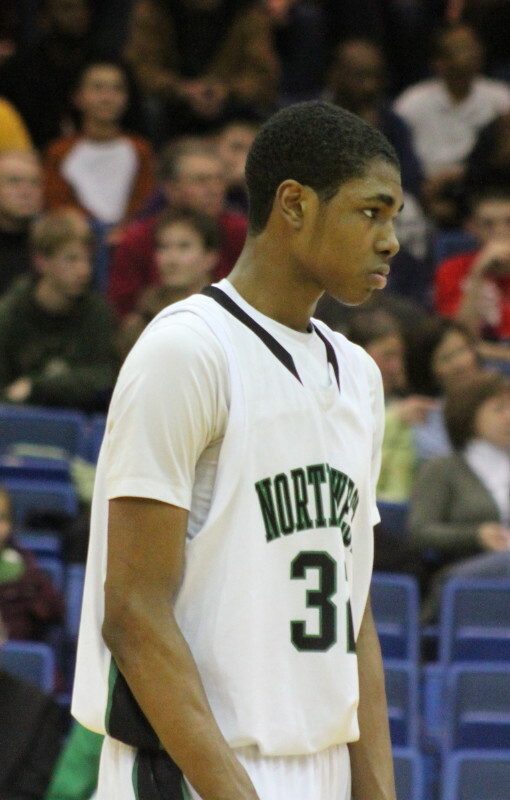 Kuran Iverson (17), JC Carr (13), and Nick Gaynor (10) topped Northwest Catholic. It was not quite a full house at CCSU. Those midweek games, where traveling is involved, is a factor. How was it possible that at a tournament semi-final there would be no programs available? Maybe everyone already knows the players on both teams. The announcer was impressive. He gave not only the scorers but also those getting steals and assists. He also informed the crowd that a favorite bad-call, profane chant was grounds for removal from the gym. 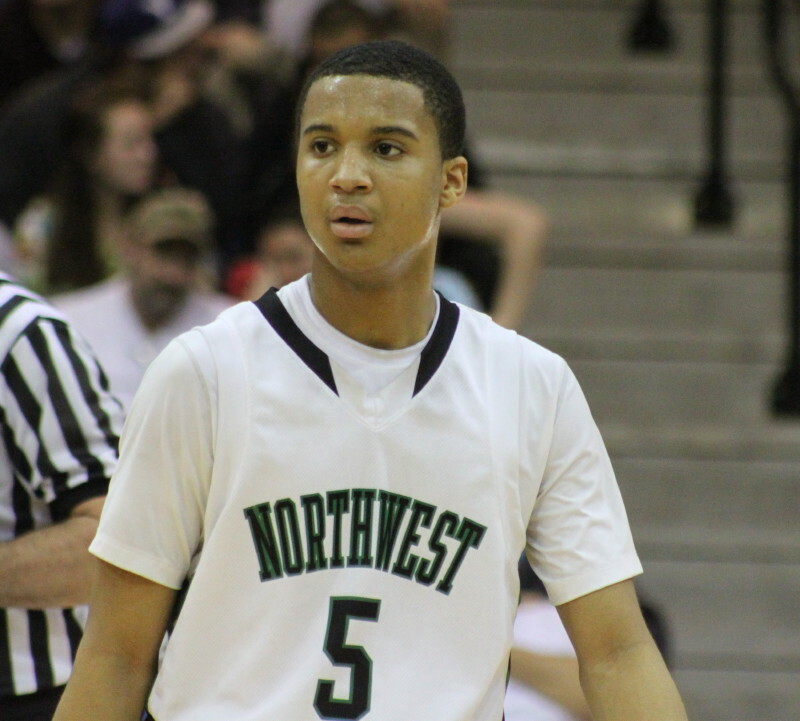 Northwest Catholic won by six (54-48) but were only 18-for-35 from the foul line. Segue: What shot is probably the least practiced among high school players? LH fans were dressed in orange while NC wore green. Optimistic LH fans chanted that Kuran Iverson “wasn’t The Answer.” The D1 colleges already expressing interest would disagree. LH tried to cover him with guards. NC could have isolated him down low but didn’t. The referees and NC were late getting back for the second half. There was one situation in the second half where NC was slow getting in place to take the ball inbounds and the referee just put the ball on the floor and started counting. LH’s chants of “Faker, Faker” when Zack Lewis was injured had me wondering about adult supervision. Jason tries for second half block. Former Lyman Hall standout, David Dempsey, was in the house watching his brother Jason. 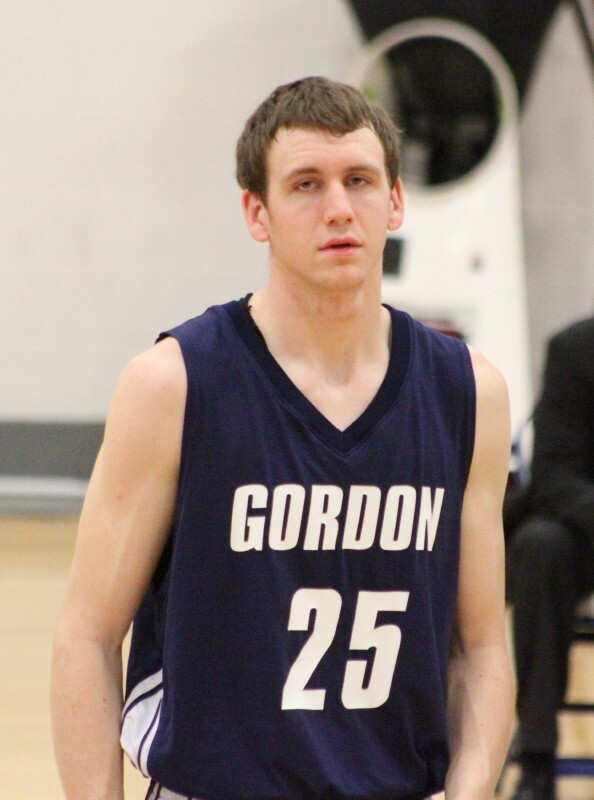 David is a sophomore at Gordon College. More than a few folks are hoping that Jason (6’7”) will join his brother for a couple years at the D3 school in Wenham (MA).